Most of us struggle with anger. Some more explosive than others, of course, but few are immune from the surging tide of frustration that hits when something doesn’t go the way we wished. Whether it’s the minor irritation of a child refusing to put on their shoes or a major relationship breakdown at home or work, the majority of us can identify with ease that moment when we last “lost it” – and we look back on that time with shame. I imagine many of us have – at one time or another – resolved to be more patient, more gentle, less combative or impulsive. Being cross with others destroys and, in our better moments, we know that’s not something we want to do. Few of those resolutions have succeeded though – the roots of anger run deep and they’re hard to root out. So how about spending the next 50 days pursuing some heart surgery? Because at its core, that’s what the book, A Small Book About A Big Problem is all about. It’s the sort of book that you could read from cover to cover in a few hours but doing so is unlikely to result in any lasting fruit. It’s designed to be read a few pages at a time, each mini-chapter building on the one before and focusing on some aspect of anger, with questions for reflection at the end. It’s a slow walk through a complex issue and one that, used humbly, will help many. I’ll be honest, there were chapters that were uncomfortable in the extreme. The one entitled “Murderer” (based on Jesus’ oh-so-challenging teaching in his Sermon on the Mount) would be a good example here. This book pulls no punches when it comes to pointing out the enormity of our sin – anger destroys lives and we need to see how awful that is – but, if you keep on reading (and please let me nudge you not to stop at that point!) there are many words of encouragement too. 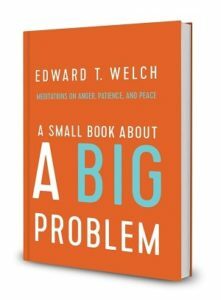 Little by little, Ed Welch takes us on a tour of the nature, types and experience of anger. He helps us see where it has its roots and the impact of its fruits. He re-introduces us to the Saviour whose grace is sufficient and encourages us to pursue something far better – a Christ-centred, counter-cultural life where enemies are loved, peace is embraced and patience is on display. And along the way he presents a smorgasbord of theological truths in the kind of bite-sized chunks that can be applied instantly to everyday life. Just in case you’re wondering, this life of peace is not achieved through the suppression of feelings of injustice (such things are always a risk in books on a topic like this). There are moments where this book encourages us to pour out our pain to the Lord. The focus here is on choosing to run to Jesus for the comfort, hope and re-orientation we all need to live for him. Like all books of this nature, it is most likely to help those who enter into the process of change humbly, prayerfully and with the support of good and godly brothers or sisters. Those who find anger a rather convenient way of getting what they want are less likely to want to change! I suspect that reading it with another person would be the ideal – 50 days feels quite a long time and it might be easy to give up without some encouragement along the way. In addition, some of the reflection questions work best when you can seek the perspective of a friend. But however you choose to read it, please let me encourage you to give it a go … at £13.99 (RRP) it feels quite expensive for its size but, in the hands of the living God, the outcome could be priceless! A Small Book About A Big Problem is available from 10ofthose and The Good Book Company.